Factoring in what forms of handicap transportation will be accessible is a major part of planning limited mobility vacations to the Florida Keys. Wheelchair accessible travel needs to be considered, even though the islands are small. This is because with the exception of Old Town Key West, it's not easy to use even motorized wheelchairs as the primary form of handicap transportation. Like all the islands, the Upper Keys which includes Key Largo, Tavernier and Islamorada are narrow, and in some cases relatively long. 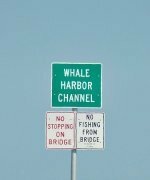 This means many of the Upper Keys attractions are strewn over a number of miles, with a portion of the area not having sidewalks. 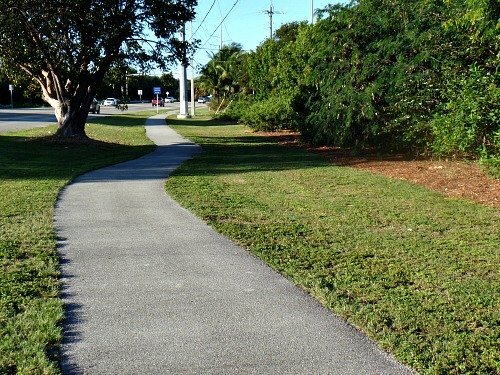 There are bicycling paths throughout the Florida Keys that are walker, jogging and wheelchair accessible, however they start and stop. When you consider the distances between attractions and restaurants, then factor in the often hot and humid climate, it's not a good option for someone solely relying on a walker or even an electric wheelchair. The Middle Keys which consists of Marathon and Key Colony Beach are again strung over a relatively long geographical area. Marathon is a bit more 'dense' in terms of Florida Keys attractions and activities. However, it would still be difficult to access the majority of the area's Florida Keys things to do, without using wheelchair accessible vehicles. The exception to depending heavily on disability transportation is Old Town Key West where it's possible to rely solely on mobility aids. As an Amazon Associate I earn from qualifying purchases such as these listed below. The area is small, and the Key West activities and attractions are packed in tightly together. This makes it very convenient to break up your Key West vacation into manageable segments so you can see and do as many things as possible without relying on handicap accessible vehicles. 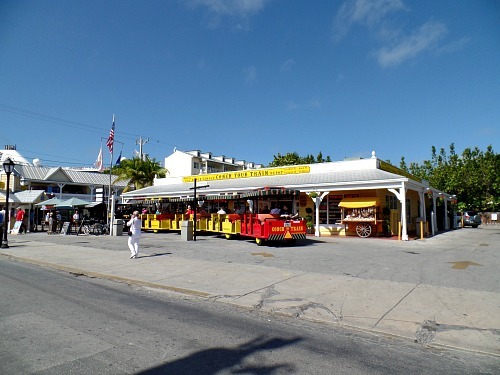 Whether you're in a mobility scooter or a manual wheelchair, it'll be relatively easily for you to maneuver around the somewhat congested sidewalks and visit the famous Key West attractions. 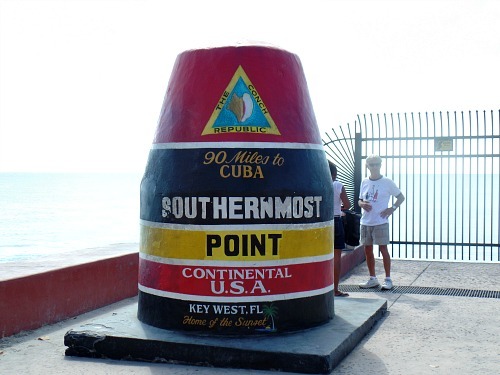 Another perk is that there are quite a few interesting Key West attractions that are free and easy to access. Some of these attractions are the Key West Cemetery, Southernmost Point Marker, White Street Pier between Higgs Beach and Rest Beach, Mallory Square, Memorial Gardens, Sunset Celebration, Key West Seaport and Harborwalk, the Oldest House in Key West, and the Florida Keys Eco-Discovery Center. In the Upper Keys at Tavernier, there's also the Florida Keys Wild Bird Center located at 93600 Overseas Hwy, MM 93.6. Having access to handicap vehicles will be necessary to reach this Center. A worthwhile visit, it's also free. However donations are greatly appreciated and the funds are directed towards the care and feeding of the birds. To get a good idea of what's available in terms of the different activities for disabled adults, children and veterans, we've compiled a comprehensive list by activity and region for you. To get to the areas outside of Key West however, you'll need to rely on handicap vehicles for transportation or get your own handicap van rental. Another handicap transportation issue relates to the geographical area of the Florida Keys. Compared to the rest of the United States, the Florida Keys are relatively tiny. This translates into the fact that many of the local transportation companies are equally small. Unfortunately this means that many of these businesses are financially unable to properly equip themselves with a wheelchair lift or other mobility aid equipment, items that are important to a person who is wheelchair bound. Fortunately, there are several options available to you on your Florida Keys vacation. These handicap equipment rental choices include handicap accessible vans, choosing from a mobility scooter rental, wheelchair rental or walker that's right for you. If you're not interested in mobility equipment rental choices, there are several wheelchair accessible taxis for hire, as well as public transportation if you're able to use this service. When planning your Florida Keys vacation, please contact businesses in advance and confirm that they can adequately accommodate your disability equipment. Take the time to discuss your specific needs including the type of wheelchair transportation you have. For the "non-handicap transportation friendly" companies, transport wheelchair issues shouldn't be a problem as long as you have a folding wheelchair. Plus, if you're one of the people with disabilities who can get in and out of a wheelchair with modest assistance, you should be able to contact any taxi service. 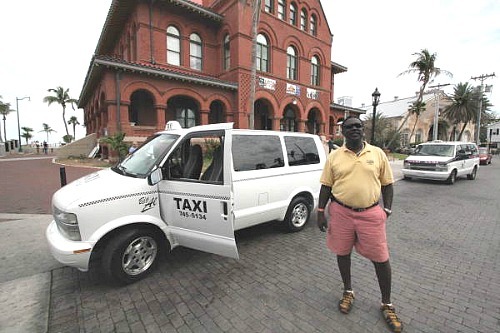 Below is a list of the various types of Florida Keys handicap transportation options available to you, including boat trips to the popular Florida Keys attraction, Fort Jefferson at the Dry Tortugas National Park. All parts of the Freedom II is wheelchair accessible. 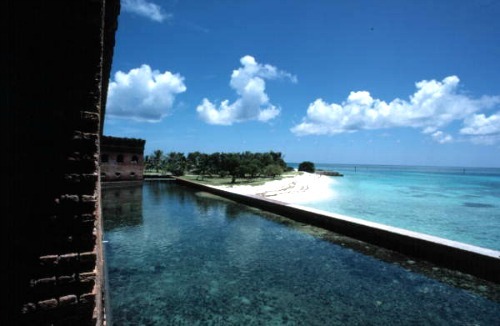 However accessing Fort Jefferson and the beaches at the Dry Tortugas National Park is a bit difficult. The old fort's main floor has some crumbling and is a bit rough, but with caution it's wheelchair accessible. The upper level does not provide for wheelchair access. The Dry Tortugas beach consists of sand and grass which can make wheelchair transportation difficult. For wheelchair sports athletes, the Dry Tortugas snorkeling portion of the trip does not include assistance from the Freedom II crew. It is the sole responsibility of the handicap person to be able to safely enter and leave the water, either alone or with assistance from a traveling companion. 6 routes provide public transportation on 14 handicap accessible buses throughout Key West, Stock Island, and to Marathon, FL, 5:30 am - 12:00 midnight. Wheelchair ramps are available at designated locations for pick ups and drop offs. If assistance is needed getting on and off the Conch Tour Train, please give the office 24 hours notice. Provide preferred date and pick up location, so a properly equipped train can meet you. Please arrive 15 minutes early, and be aware that only a folding wheelchair is allowed on the train. Handicap transportation is only provided on certain Old Town Trolleys. These are handicap accessible with rear mount hydraulic wheelchair lifts. Also only stops 1, 2, 3, 6, 7, 8, and 10 along the route can accommodate the safe loading of wheelchairs. Please contact the office 24 hours in advance and indicate which day and location you'll be at, and arrive 15 minutes early. Handicap accessible van rental with local airport service including drop off and pick up at Fort Lauderdale, Miami, and Florida Keys for handicapped van rental. You'll find that there are other options for handicap vehicles and disability equipment available to you. There are different mobility aids companies online that service the Key Largo area. However, you'll have to reserve your wheelchair rental, mobility scooter, or walker in advance before you arrive. Whether you use handicapped vans or other forms of transportation for disabled people, once you've arrived in the Keys you'll find it'll be relatively easy to get around. The combination of 'small' with the 'willingness' of local businesses to help, will go a long way in ensuring you have a safe, comfortable and delightful Florida Keys vacation.